MTSU plans March 22 'True Blue.. Still wishing you could go behind the scenes of that all-star PBS concert special “Pa’s Fiddle: The Music of America,” featuring tunes from the Laura Ingalls Wilder books? 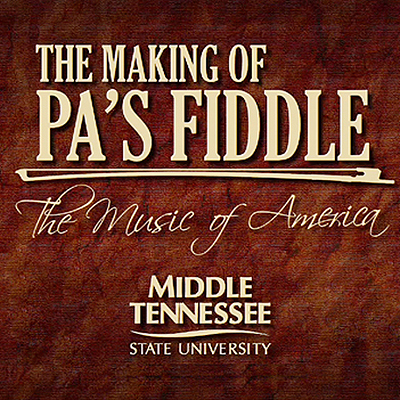 Tennessee’s PBS stations are giving you a free all-access pass Saturday and Sunday, Dec. 7 and 8, to “The Making of Pa’s Fiddle,” a half-hour documentary on the 2012 event produced by MTSU Department of Electronic Media Communication students and EMC professor Tom Neff. Thanks to The Tennessee Channel, a joint effort of Tennessee’s six PBS stations, “The Making of Pa’s Fiddle” will air statewide simultaneously Saturday night and Sunday on each station’s secondary digital channel. The PBS stations’ secondary digital channels are available via antenna on a digital television or an analog TV with a DTV converter box. Most also are available through local TV providers; NPT2 is available in the Nashville area on Comcast Channel 241 and Charter Cable channel 191. Senior Sam Willey, an EMC major, directed the project. In January 2012, Nashville all-stars brought Charles “Pa” Ingalls’ old-time fiddle music and songs alive for a PBS concert special inside the Loveless Barn. The “Making of Pa’s Fiddle” documentary had been available only on DVD as part of a special PBS donors’ premium package when the concert aired nationwide in June 2012. “There were several production companies involved in the effort of the ‘Pa’s Fiddle’ show itself, and all of them were surprised when they discovered the documentary group consisted solely of students,” Neff said. “They had assumed they were professional from their skills and behavior. I thought that was a great compliment to the students. WCTE-TV in Cookeville, Knoxville-based WETP, WTCI-TV in Chattanooga, WLJT-TV in Martin and WKNO-TV in Memphis also will air the MTSU-produced documentary this weekend. You can visit The Tennessee Channel’s website for station details. The original “Pa’s Fiddle” story, including a photo gallery and video, is available here . A follow-up story about the national premiere is available here .